Research conducted by the Institute of the Human Brain at the University of Queensland in Australia indicates that not only the age of the mother affects the intelligence of the child. The progeny of fathers over forty is at a later age more exposed to schizophrenia and autism. Such babies also obtained weaker results when solving intelligence tests, which emphasized problems with concentration, memorizing, understanding of content and reading abilities. 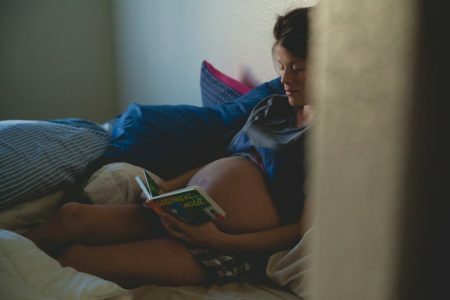 The American Academy of Pediatrics has published studies that show that babies born between 37 and 38 weeks of pregnancy have less developed reading skills than those born after the 39th week. Similarly as regards the results of solving mathematical problems. The omega-3 and omega-6 fatty acids are one of the most important nutrients necessary to develop a healthy brain structure in the infant. Eating them during pregnancy will have a beneficial effect on the mother’s health – acids protect against preeclampsia and limit the possibility of premature delivery. According to a study published in JAMA Psychiatry – a scientific journal published by the American Medical Society – in children of mothers who during pregnancy were in a polluted environment with car exhausts, autism developed more often. However, research does not prove that contamination is the main cause of the disease, but a factor that increases the risk of its occurrence. From which week of pregnancy can we start “talking to the belly”? Do not wait a moment. It does not matter if the child hears or not. It simply breathes the mother’s organism. The spoken warm, loving words build a proper emotional bond between the child and his parents. For mothers who remain physically active, a larger placenta develops during pregnancy. This causes the child in the mother’s womb to be supplied with more oxygen and nutrients, and also easier to get rid of carbon dioxide. It does not matter if you’re reading to him or telling him how your day has been – the most important thing is that you talk to him. Your child hears you perfectly well and perhaps he already writes the words you say to him in his memory. Recent research results show that iron deficiency in women in the first months of pregnancy can inhibit the normal development of the child’s brain. Toddlers with his deficiency are also learning to speak slowly. If you want to give birth to a wise child, do not forget to provide the body with the necessary doses of iron in pregnancy – both in food and dietary supplements. Another very important vitamin responsible for the child’s brain development is folic acid and vitamin D – they should also be included in your diet. Pupils with vitamin D deficiency have more frequent problems learning a language at school. Surround yourself with peace and love, make sure that pregnancy is a pleasant and relaxing time. Avoid conflict situations as well as nervous people in your environment. Stress in pregnancy, which is also experienced by the fetus, can affect the environment in which it develops, leading to premature birth. This situation adversely affects the proper functioning of the brain. Try to provide the best conditions for the child’s development during pregnancy. Take care of health and good mental and physical condition, and in the future your child can grow into a real genius.